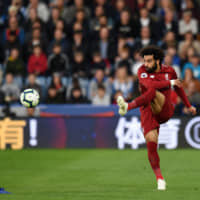 LONDON - Manchester City brushed aside Burnley 5-0 on Saturday but Liverpool kept pace with the champions after Mohamed Salah rediscovered his scoring touch to fire his team to victory against lowly Huddersfield. Earlier, Chelsea — which had been level with City and Liverpool before the weekend — needed a last-gasp equalizer to grab a point against Manchester United. Tottenham moved into the top four after a 1-0 victory at West Ham, with Arsenal not in action until Monday. Pep Guardiola’s side, which missed a late penalty that would have given it a victory over Liverpool at Anfield earlier this month, made it seven wins from nine league games as Burnley goalkeeper Joe Hart endured a miserable return to his former club. With the defending champion slipping ominously into gear, midfielder Kevin De Bruyne came on for just his second appearance of the season following a knee injury he suffered in August. City has scored 26 Premier League goals already during this campaign — putting it on course to beat the record 106 it totalled last season. 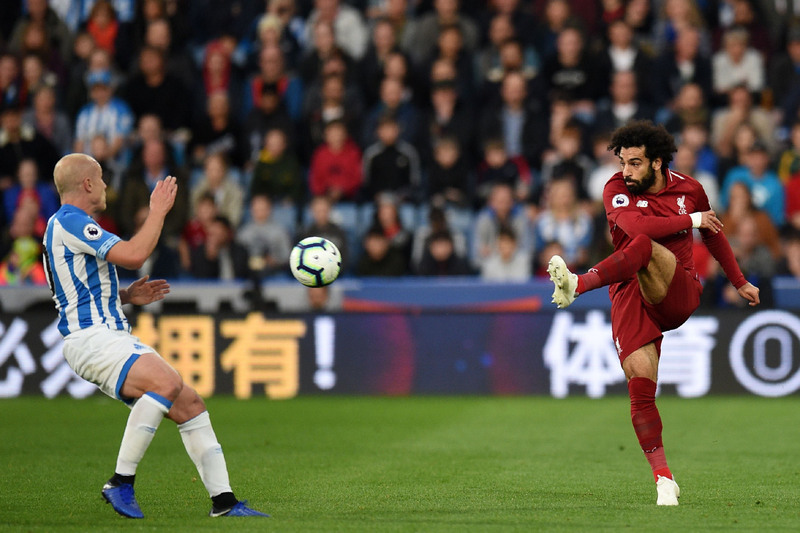 Jurgen Klopp’s Liverpool was forced to tough it out against Huddersfield in the late game, with Salah scoring the only goal in a 1-0 win midway through the first half. “It was a good game from Huddersfield and not so good (a) game from us,” Klopp told BT Sport. “So we’ll take it. Liverpool, gunning for a first top-flight title since 1990, is level with City on 23 points but trails its rivals on goal difference. Chelsea, in third, has 21 points — level with Tottenham. All of the top three remain unbeaten. In Saturday’s early game, Ross Barkley scored in the sixth minute of injury time at Stamford Bridge to level the match at 2-2 after Anthony Martial had scored twice in the second half to cancel out Antonio Rudiger’s opener. It was a bitter blow for under-pressure United boss Jose Mourinho, returning to his former club after a poor start to the season, and he lost his cool in emotional scenes in the final seconds. Mourinho took exception to the celebrations of one of Chelsea’s backroom staff, Marco Ianni, who ran in front of the Portuguese on the touchline, as United were deprived of a desperately needed win. But after the final whistle the United boss played down the incident, saying Ianni had apologized. “(It was) not celebrations, but bad education. But I also made mistakes in football matches and I will make more, so after the game when he came to offer his apologies, I accept,” added Mourinho. The United boss, who has a tough run of fixtures coming up, including games against Juventus and Manchester City, described the draw as an “awful” result for his team, who roared back from 2-0 down to beat Newcastle United in their last match. Erik Lamela struck with a cool header late in the first half at the London Stadium to give Spurs their fourth successive league victory. That made it five goals in just eight appearances this season for Lamela, who was making his first league start of the campaign. Mauricio Pochettino praised the Argentine, who has faced many injury problems since he joined the club, and hailed Hugo Lloris as “one of the best goalkeepers in the world” after his display. Elsewhere, Cardiff beat Fulham 4-2 to lift themselves off the foot of the table. Newcastle are languishing in bottom spot after a 1-0 home loss to Brighton while Watford beat Wolves 2-0 and Bournemouth played out a goalless draw with Southampton.